With a 360-degree load radius, the Terex Crossover 8000 Boom Truck out lifts other boom trucks in North America. 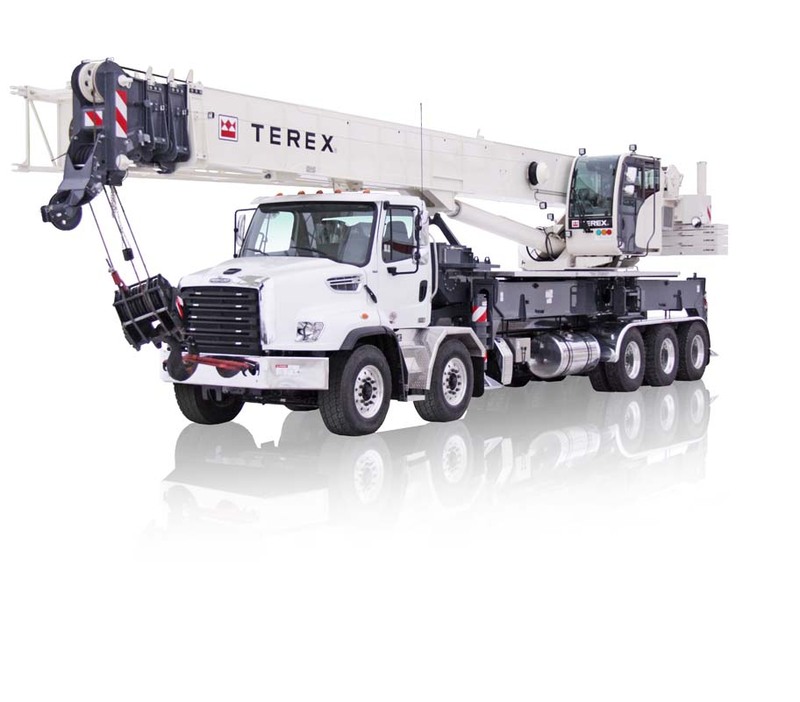 The Terex Crane also features an 80-ton capacity and 126-feet boom length. It also offers the same upper structure and load ratings as the Terex T780 Truck Crane, whether lifting from rear, front or sides. The Terex X-pattern outrigger design of the Crossover 8000 Boom Truck helps reduce chassis torsion, which extends the chassis life. It does this by lowering the center of gravity and detaching the top of the crane from the truck chassis. Due to the design of the three-position outrigger system, there's no need for a front stabilizer jack. This also decreases the weight and length of the crane. The Terex Crossover 8000 Boom Truck's 126-feet boom length provides a 189-feet maximum tip height. The Terex crane has two jib designs: a fixed 33-feet length and one that extends to 57 feet. Both designs offer 0-, 15- and 30-degree offset positions. The crane is also equipped with a top swivel ball that has a 7-ton hook and latch. There is also a hook block with five sheaves that gives an 80-ton capacity and 10-feet radius. The Terex boom truck comes with one or two winches, which gives the crane flexibility to deal with complex lifts. The Terex Crossover 8000 Boom Truck is the first in its class to feature the new Terex operator's cab. The cab has a variable tilt-up feature that extends to 18 degrees, which improves work area vision. The Terex operator's cab features a new air conditioning and heating system complete with individual air vents. The seat is multi-adjustable and has a high back, an air-ride suspension and arm rests. Scott-Macon Equipment is an authorized dealer of Terex cranes. We offer the Terex Crossover 8000 Boom Truck for sale and rent. Scott-Macon Equipment provides excellent customer service for construction companies needing a reliable and powerful crane. Contact us today for more information about the Terex Crossover 8000 Boom Truck or to get a quote.